full clinical guidance on emergency care for pediatric in the good practical question-and-answer methods of The Secrets Series,pediatric emergency handbook cover all pedia chapter by questions and highly practical answer. consists of six chapter cover all types of emergency and life threatening conditions for children. a question-and-answer format, bulleted lists, mnemonics, and tips from the authors. 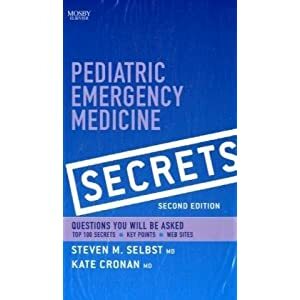 Includes a chapter containing the "Top 100 Secrets" in pediatric emergency medicine, enabling you to quickly review essential material about pedia emergency. and Patient Safety in the ED. Offers a new two-color page layout and "Key Points" boxes to enhance your reference power.